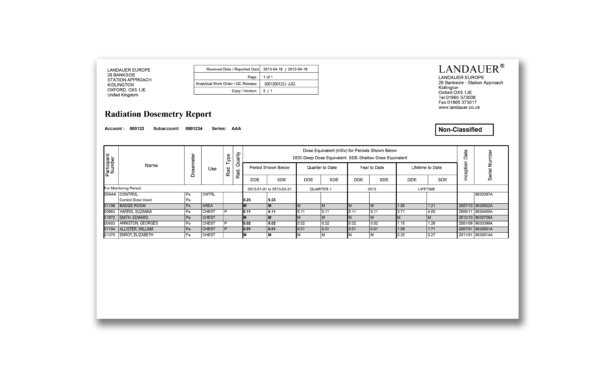 LANDAUER® provides a reliable and fast readout and a record keeping service approved by the HSE for the UK and the EPA for Ireland. Each type of dosimeter is analysed in a different way according to the technology used. Specifically trained and experienced staff use bespoke equipment to process the dosimeters and analyse the detectors. Built-in quality controls and systems ensure the reliability of the equipment and dose assessments. They have the ability to re-examine and verify dose assessments. All processing is performed by LANDAUER and has been approved by the HSE for the UK and the EPA for Ireland in accordance with our certificates of approval. Once the analysis of the dosimeters is complete, a report is issued showing the type and dose received by each participant. other relevant data used in the management of a dosimetry program. In accordance with UK legislation, reports are issued within 14 days of receipt of the dosimeters at our UK office. High doses are notified immediately by e-mail. emergency reporting for high dose assessments.